Charles L. Turnbough, Jr., Professor of Microbiology, received a B.A. in Chemistry from Monmouth College (1969) and an M.S. in Chemistry (1970) and a Ph.D. in Biochemistry (1975) from the University of Illinois. Dr. Turnbough’s graduate studies were with Dr. Robert L. Switzer on the selective inactivation of enzymes during sporulation in Bacillus subtilis. He did postdoctoral studies in molecular genetics in the laboratories of Dr. Bruce N. Ames at the University of California, Berkeley and Dr. John L. Ingraham at the University of California, Davis. 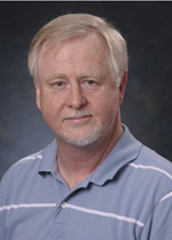 In 1980, Dr. Turnbough joined the faculty of the Department of Microbiology at the University of Alabama at Birmingham (UAB), where he has worked his entire academic career. Dr. Turnbough served as an ASM Foundation for Microbiology Lecturer from 1993 to 1995 and was elected to Fellowship in the American Academy of Microbiology in 2011. There are two major research projects in the Turnbough laboratory. The first project is to determine the structure and function of the outermost exosporium layer of Bacillus anthracis spores, an established weapon of bioterrorism that causes the lethal disease anthrax. The exosporium is a bipartite structure consisting of a paracrystalline basal layer and an external hair-like nap. The filaments of the nap are formed by trimers of the collagen-like glycoprotein BclA, while the basal layer contains approximately 20 different proteins. Most basal layer proteins are structural elements that undergo posttranslational modifications necessary for stable exosporium assembly. The mechanisms and functions of several of these modifications are currently being actively studied. These modifications include multi-site phosphorylation of basal layer protein ExsB, glycosylation of BclA, and the apparently spontaneous covalent atachment of BclA to the basal layer protein BxpB. Based on the BclA-BxpB attachment mechanism, the Turnbough lab is also developing a new generally applicable vaccine platform that promotes a strong, lasting, and potentially multivalent immune response. The second project focuses on mechanisms of gene regulation in bacteria, particularly Escherichia coli, that involve reiterative transcription and/or transcription start site switching. Reiterative transcription is the repetitive addition of a nucleotide to the 3’ end of a nascent transcript due to slippage between the transcript and DNA template. Start site switching is the selection of alternative start sites at a single promoter, which results in the synthesis of transcripts with different potentials for translation. Previous studies have described control mechanisms in which reiterative transcription during initiation and start site switching act independently or together to regulate the expression of operons involved in pyrimidine biosynthesis and salvage. Recently, additional operons have been shown to use reiterative transcription and/or start site switching to regulate their expression by mechanisms unlike those previously described. These new mechanisms are presently being elucidated. In addition, studies are in progress to define the mechanisms of reiterative transcription and start site switching and the factors that modulate the extent of these reactions. Because the basic machinery of transcription is highly conserved throughout the biological world, it is possible that all life forms employ regulatory mechanisms analogous to those being unraveled in the Turnbough lab. Recent studies suggest that this is indeed the case and that such mechanisms contribute to human health.